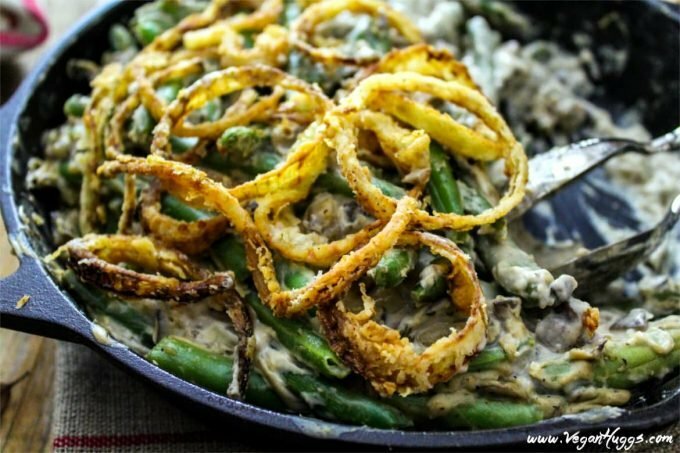 This Vegan Green Bean Casserole is creamy, crunchy & savory! 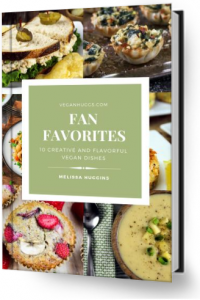 It’s so close to the traditional version, that you’ll have to keep saying, “yep, it’s vegan!” to your holiday guests. Oh my, the big day is literally around the corner – Are you guys ready? If not, don’t worry, because you still have a week to prepare (Ok, it’s a little less, but no pressure). You still have time to get your list ready and you can get most of your shopping done this weekend. 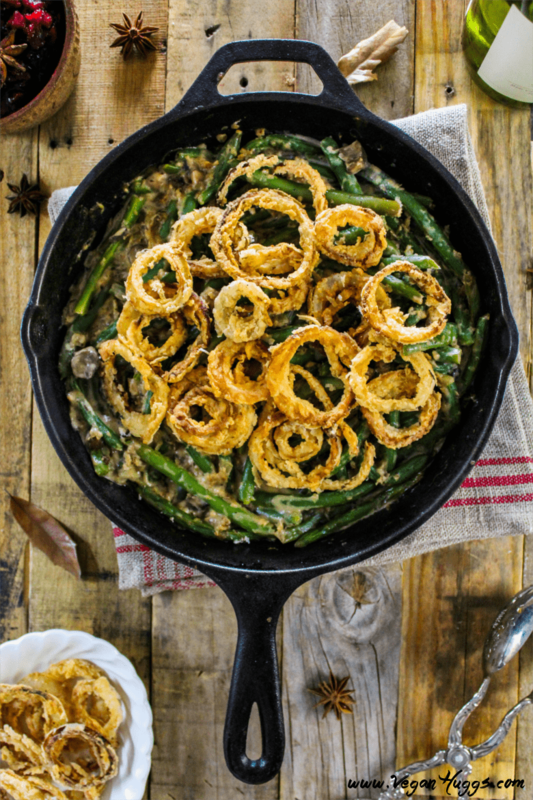 Oh, and remember to pick up the green beans for this “almost traditional”, Vegan Green Bean Casserole. This dish is so easy to veganize that it’s almost criminal not to! Your guests won’t even know the difference. They will be astonished that you don’t need dairy to make such a creamy and flavorful holiday dish – Or, that you don’t need a dead turkey to celebrate thankfulness. My Meatless-Meatloaf w/ Ketchup Glaze is always a big hit for everyone and noBody had to die for it. Sounds like a win-win to me! You can show them how to enjoy the traditions of Thanksgiving but in a kinder way. I love inviting omni friends to dinner and watch their faces go from skeptical to amazement. 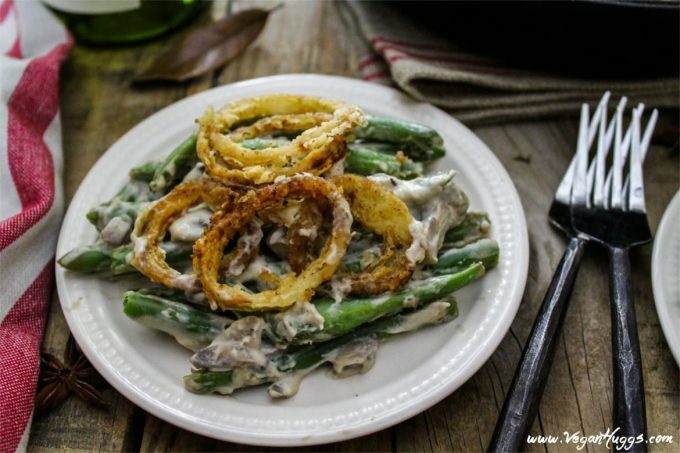 Who can resist tender & crisp veggies nestled in a mushroom cream sauce, and topped with homemade crispy fried onions? I sure can’t! What’s Vegan Green Bean Casserole made with? You won’t be needing condensed mushroom soup on your list (a.k.a heart attack in a can) because you’ll be creating your own rich, creamy & savory mushroom sauce. The magic ingredient is cashews and they will turn this dish into a dreamy delight. It’s so darn quick to make and hella delicious, too! 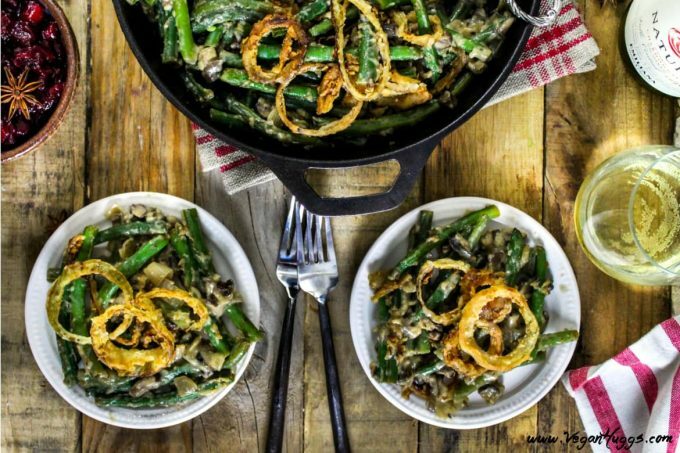 This vegan green bean casserole is warm, comforting, creamy, satisfying, holiday-y, traditional, bubbly & golden brown. Those crispy fried onions – they sound fancy and all, but they are really easy to prepare. I know, it’s easier to top this casserole with store-bought fried onions, but why not try to make them yourself this year? It’s really not that much more work and they are quite tasty. You just soak the sliced onions in a vegan buttermilk for 20 minutes, dip them in seasoned flour and fry until golden & crispy. Not too hard, right? Now frying onions isn’t the healthiest thing to do, but I think it’s fine on occasion. I use quality cooking oil with a high smoke point, and just lightly fry them. If you feel more comfortable, you can always bake them in the oven, too. If you do buy the store-bought variety, just make sure to check the label for vegan ingredients. Ever have green bean casserole with limp beans? Ugh, it’s the worst! For this recipe, I use fresh green beans and quickly blanch them in boiling water for 5 minutes. Then I rinse them off with cold water to stop them from cooking. The results – a green bean that’s vibrant, slightly tender and crispy. Your vegan green bean casserole will have lots of texture and will be far from mush. I added thyme, sage and a pinch of nutmeg and together, they enhance this dish with their warm aromatic flavors. I also add a bit of soy sauce for depth. My mouth is watering just thinking about it! Oh yeah, don’t forget to add wine to that shopping list. Yes, for drinking and for cooking! Now you’ll have an excuse to have that open bottle on the counter 😉 . I added white wine, which really balances out the flavor of this dish. It gives it that extra bite, too. Can I make Green Bean Casserole ahead of time? Yes, you can make the casserole the day before up until the baking step. Also, it’s best to make the onions the same day so they’re fresh and crispy. You can slice and soak them overnight in the fridge so they’ll be ready to fry right away. The casserole will take longer to heat up, so cover it with foil and bake for about 40-45 minutes. Now top with onions and bake for 15-20 minutes more. I make my Apple Cranberry Sauce 1-2 days before and store it in the fridge. It will be chilled, fresh and ready for the table, so forget about that can-shaped jelly blob. My Meatless-Meatloaf w/ Ketchup Glaze can be prepped 1-2 days before, too. You can either fully cook it and reheat, or just prepare the mixture and put into your loaf pan and cook the next day. I make my Sourdough Bread Stuffing (up until the baking step) the night before and store it in the fridge. The next day I cover it in foil, add more veggie broth if needed, and bake. It never comes out soggy or dry and I feel like the flavors have infused better. For my Roasted Sweet Potatoes w/ Pecan Crunch, I will roast the potatoes the day before, let them cool a bit and store them in the fridge. Then I make the crumble and store it in a container on the counter. The next day, I just pop the potatoes in the oven with vegan butter, fresh cranberries and top it off with the crumble. Easy-peasy! I want to wish you all a wonderful, warm & safe holiday! 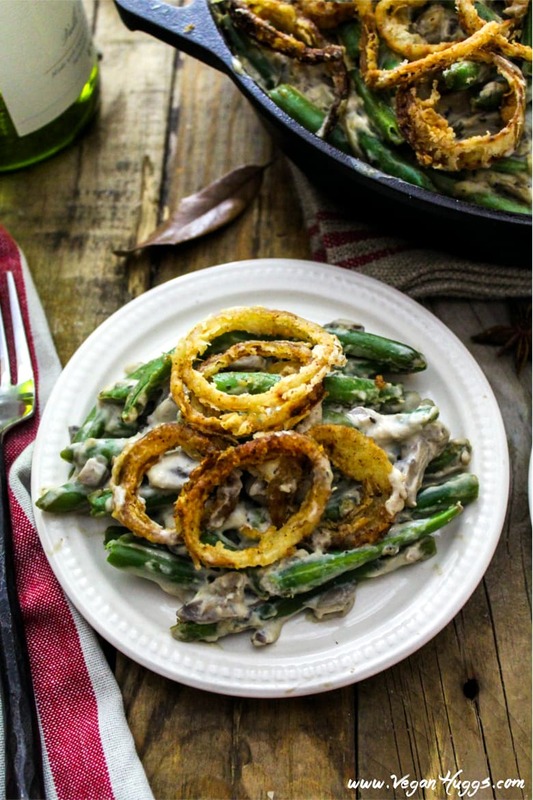 This Vegan Green Bean Casserole is creamy, crunchy & savory! It's so close to the traditional version, that you'll have to keep saying, "yep, it's vegan!" to your holiday guests. Fill the pan with the onions, but don't overcrowd them, because this will cause steam between them (you'll likely need to fry them in a few batches). Fry evenly on both sides, until light golden brown (about 1-2 minutes each side). Add more oil as needed. These cook quickly so keep a close eye so they don't burn. When done, place on a large paper towel-lined plate to absorb excess oil. * Prep time doesn't include soaking time for onions or cashews. *I like to have extra onions for the table, so I use two large onions. I double the recipe above. They are a big hit every year. Could you omit or replace the white wine if you can’t have alcohol? I love green bean casserole! I make mine with an onion based gravy. No canned mushroom soup for me either! This looks delicious! That creamy mushroom sauce sounds divine! And those crispy onions – YUM! I love an excuse to open wine while cooking! This sounds amazing. 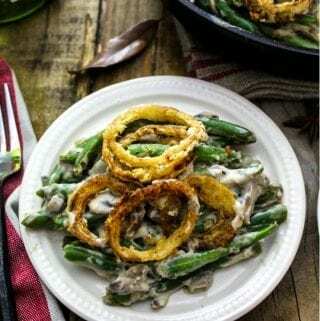 I have only had one green bean casserole that didn’t come out too well but this one looks soooo delicious! Oh my gosh, those giant fried onions are calling my name! Thank you, Becky! Have a Happy Thanksgiving! Those fried onions look amazing! Thanks for sharing your Thanksgiving prep advice. It’s so helpful! Reading this post and looking at the beautiful pictures made me soooo hungry!!! Your recipe looks so delicious Melissa!!! And heck yeah for that bottle of wine (for the culinary reasons 😉 )!